Love our photos? 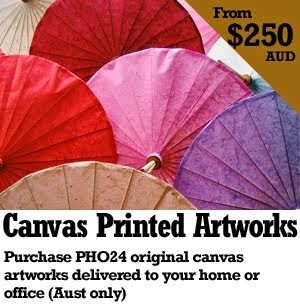 Purchase any PHO24 artworks professionally printed on canvas and delivered to your door (Australia only). Each photo is limited to 5 prints only so you're assured that your piece of art is rare and exclusive. Prices include printing and usage license. Choose from any original photos by PHO24 from our gallery. Message us with the product code. Note: only indicated PHO24 original photos with product codes are available for purchase. Invoice will be issued with payment and delivery instructions (Australia only).